← I went to Ikea and All I Got Was This Kakor Havreflarn. A Veeeerry Merry Unbirthday….to YOU! 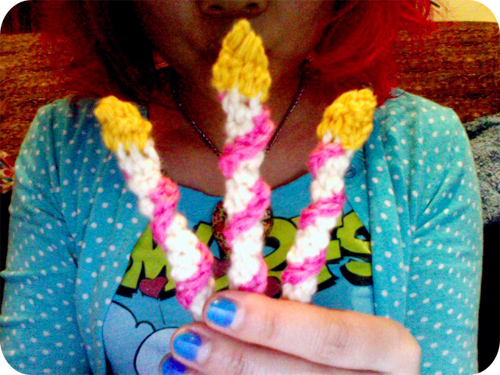 I crocheted these funny birthday candles for a felted project. Cross your fingers they don’t melt and mutate in the felting process!! 8 Responses to A Veeeerry Merry Unbirthday….to YOU! wao amazing … I dont no how to crochet but I really love what you do with so simple materials …. Very cute! Can’t wait to see them felted! They’re adorable! You are soo creative! but they are so cute the way they are right now. Very cute but now I have that song stuck in my head, thank you very much. LOL!